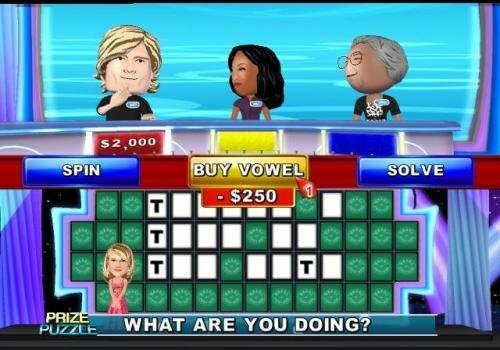 For those that have never encountered the popular game show before, Wheel of Fortune‘s premise revolves around solving word puzzles taken from a range of differing categories. Contestants are able to slowly reveal such words by taking turns to guess individual letters that form the whole. To do so, players take turns to spin a prize wheel that awards them with varying cash amounts depending on whether they guess correct letters, whilst also providing the opportunity to win further prizes such as holidays, cars and all manner of electrical products. The TV show dates back to the 1970’s when it was first aired in the US, and also became a popular entertainment highlight within the UK too until it fell victim to being axed in 2001 and has, regrettably, not been seen since. However it is still going strong across the pond, and THQ has seen fit to invite players to bring the game show into their living rooms through this latest budget title offering for Wii. Starring the voice talents of the US show hosts, Pat Sajak and Vanna White, is this truly a game show experience worthy of your attention? Predictably, you can dive straight into the game as either a single-player experience either with or without the competition of A.I. controlled competitors or in multiplayer with up to three players. You’ll find yourself battling through a variety of rounds, including ‘Toss-Up’s’ where players must buzz-in as soon as they can guess the answer as it is slowly revealed to them or the usual regular gameplay in which players take turns to spin the wheel and slowly reveal the answer by correctly picking off one letter at a time. Shaking up the gameplay are inclusions such as the ‘Free Play’ wedge and ‘Wild Card,’ with the former allowing you to freely call a consonant, vowel or to guess the answer without losing your turn if incorrect. Whereas the Wild Card allows you to call another consonant at the value of the prior spin or may be saved for use within the Bonus Round, if you get that far, to aid you in revealing an extra consonant. Sprinkling a little differentiation when playing against human opponents in multiplayer is the inclusion of mini games, effectively classed as ‘Commercial Breaks’ by the developer, that are played between each of the core rounds. These remain to be ‘Guess the Word’ based affairs, with the victor gaining a point towards being the ‘Crowd Pleaser’ on the show rather than any monetary bonus. Whilst introducing varying rules that break away from the core gameplay, it would’ve been nice to see a greater alteration in terms of style instead of offering more word-based puzzles. The use of motion control functionality is a little basic, with players being asked to hold B down and to then flick the Wii remote to the left to spin the wheel – the speed at which you do so being dependant on the height of a meter in the lower left-hand corner that indicates the strength at which you spin. Such utilisation feels a little simple and tacked on, a button press could perform the same function and remove the necessity to flick, yet the developer takes the experience one step further through the implementation of Wii Speak. Those with Nintendo’s oft-neglected microphone accessory will be able to call out the actions that they want to perform, shouting phrases coherently such as ‘buy vowels,’ ‘solve puzzles’ or ‘spin.’ As you can expect, you’ll need to be relatively near to the Wii Speak device for it to hear you clearly, and you’ll have to talk slowly and with clarity. The developer recommends that you use it for single-player only, yet surely the game is more suited to being played in groups? In addition to this, you are also able to record your own voice effects for your contestants, adding a further degree of vocal customisation to the mix. Regardless, it is great to see that Wii Speak has received further support when its future is clouded in doubt, yet unfortunately, most will find that its use here slows down and hinders progression, rather than necessarily enhancing the gameplay. A nice inclusion, yet one that will perhaps not be utilised by many. The use of Mii-esque character design also lends itself well to the overall presentation, with a noteworthy inclusion of not only being able to use your own Mii characters within the game but also being granted the ability to dress them in a variety of outfits. Such customisation serves well to personalise the appearance of your characters within the game. The wardrobe of costumes is also able to be continually expanded, as you are actively encouraged to strive to unlock a number of in-game rewards, including new Stages to be used as backdrops for the show, Concept Art and further outfits to customise your own contestants with. It’s a welcome addition that will encourage further play time for many. On top of this, you can also keep a track of your overall statistics, as well as completing a number of objectives based ‘Awards’ such as winning $2,000 during a single round or winning a specific number of games for example. It all works particularly well, yet Wheel of Fortune‘s biggest crime lies in localisation. Whilst such a release is clearly related to the ongoing popularity of the show in the US, it seems a little short-sighted to have not geared a PAL version that includes word puzzles that are more suited to a European audience. The Americanised nature the majority of the game will no doubt begin to hinder the enjoyment of European players as they are left sat in bemusement of encountering puzzle answers that they will have never heard of before. For example, one such playthrough presented me with having to guess The Midnight Ride of Paul Revere, a key event in American history according to Google, and Sashimi, a Japanese delicacy. Whilst I am keen to learn new things, I am sure you can agree that the existence of either is hardly going to be common knowledge to the average Wii audience. Such frustrations are further coupled by the inability of being able to alter the difficulty of such answers to match whoever is playing the game. With Wheel of Fortune seeming so well-suited as being a family-orientated festive offering, altering the difficulty within the game between Easy, Medium, Hard or Custom only relates to the competitive nature of your A.I. opponents rather than that of the puzzle answers that you are left to guess. Unless playing in teams with more adult players, would a group of youngsters be able to guess the aforementioned answers above, or even further examples of food such as Marinated Onions or Fresh Parsnips? Probably not, seeing as they’re more attributed to the cuisine of McDonald’s or Pizza Hut, and it is here that Wheel of Fortune ultimately spins its own downfall. A further disappointment is that for those looking to enjoy the multiplayer side of the title, the game requires that each player wishing to play has their own Wii Remote rather than a single controller being shared amongst a group. The expectation that every Wii owner has three Wii Remotes seems a little unfair, and it would seem that a corner has been cut here. In addition, the maximum amount of players being set at three rather than four is also a little perplexing, to say the least. Still, larger groups wishing to play may team up I guess. Whilst there are many elements to applaud within the design of Wheel of Fortune, a lack of thought in regards to its core quizzical content holds the entire experience back from fulfilling its potential. It is a tremendous shame as there is still enough to enjoy here, it is just a little too taxing to be enjoyed by the broad audience that it should have been able to appeal to.